Bob Woodruff is the 2012 recipient of the Invisible Disabilities Association Inspiration Honors Award. Bob Woodruff was chosen because as traumatic brain injury survivor he inspires others injured with TBI to keep fighting and to use their challenges and triumphs to help encourage others. Bob founded the Bob Woodruff Foundation to honor and encourage veterans as well as service men and women living with invisible disabilities. Bob is an amazing inspiration and is making a difference in the lives of others. 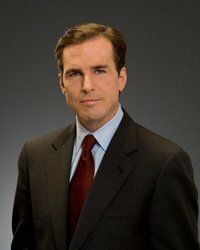 Bob Woodruff joined ABC News in 1996 and has covered major stories for the network throughout the country and around the world. He was named co-anchor of ABC’s World News Tonight in December 2005. On January 29, 2006, while reporting on U.S. and Iraqi security forces, Mr. Woodruff was seriously injured by a roadside bomb that struck his vehicle near Taji, Iraq. In February 2007, just 13 months after being wounded in Iraq, Mr. Woodruff returned to ABC News with his first on-air report, To Iraq and Back: Bob Woodruff Reports. The hour-long, primetime documentary chronicled his traumatic brain injury, painstaking recovery, and the plight of thousands of service members returning from Iraq and Afghanistan with similar injuries. Mr. Woodruff continues to cover traumatic brain injuries and was honored with a Peabody Award in 2008 for his reporting on the subject. Before moving to New York in 2002, Mr. Woodruff worked out of ABC News’ London Bureau. After the September 11 attacks, he was among the first Western reporters into Pakistan and was one of ABC’s lead foreign correspondents during the war in Afghanistan, reporting from Kabul and Kandahar on the fall of the Taliban. His overseas reporting of the fallout from September 11 was part of ABC News’ coverage recognized with the Alfred I. duPont Award and the George Foster Peabody Award, the two highest honors in broadcast journalism. Prior to becoming a journalist, Mr. Woodruff was an attorney. In 1989, while teaching law in Beijing, he was hired by CBS News to work as a translator during the Tiananmen Square uprising, and a short time later he changed careers. As ABC’s Justice Department correspondent in Washington in the late 1990s, Mr. Woodruff covered the office of Attorney General Janet Reno, the FBI and the ATF. In 1999 he reported from Belgrade and Kosovo during the NATO bombing of Yugoslavia. Since then he has reported extensively on Europe and the Middle East. In February 2007, Mr. Woodruff and his wife Lee published the best-selling memoir In An Instant: A Family’s Journey of Love and Healing, chronicling his injuries in Iraq and how their family persevered through a time of intense trauma and uncertainty. The Woodruff family also established the Bob Woodruff Foundation to help heal the physical and hidden wounds of war by providing resources and support to injured service members, veterans and their families. In July 2008, Woodruff began anchoring Focus Earth, a weekly eco-newscast for Planet Green, Discovery Communications’ 24/7 eco-lifestyle network. Mr. Woodruff has a J.D. from the University of Michigan Law School and a B.A. from Colgate University. He and his wife Lee have four children.